Shop Boston Tea Company online at BostonTea.com for all your tea and tea accessory needs. Boston Tea Company carries Black Tea, Flavored Black Tea, Green Tea, Herbal Tea, Oolong Tea, Rooibos Tea, White Tea, Decaffeinated Tea, Fair Trade Tea, Full Leaf Tea, Organic Tea, Assorted Packs, Gift Sets, Tea Chests, Tea Leaves for Life, Tea Accessories, Tea Pots and Tea Treats. Save on your next purchase from BostonTea.com with Boston Tea Company discounts, Boston Tea Company coupons, Boston Tea Company promotions and Boston Tea Company savings from 58coupons.com. Enjoy free shipping on orders over $100 or more from BostonTea.com. Click link to add items to your cart. Act now and take advantage of a 5% discount on your order of $100 or more with this coupon code from Boston Tea Co. Enjoy some flavorful & aromatic organic tea from Boston Tea Company for only $13. Click link to view. 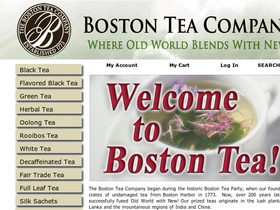 Boston Tea Company is currently charging sales tax in New Jersey only. Click link to start saving.